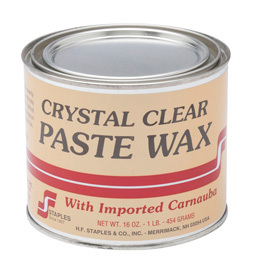 Staples® Crystal Clear Paste Wax with imported Carnauba has been one of America's premium waxes since 1897. This wax provides a hard, clear non-yellowing film of unsurpassed durability and protection as well as bringing out the richness and luster in woodwork of all kinds. It is recommended for use over oil finishes, or can be applied with 0000 steel wool to polish and control the sheen on surface finishes such as lacquers, polyurethanes, or varnish. A gentle buffing with a soft paper towel or flannel cloth can produce a low sheen to a high polish. This wax does not contain beeswax or silicones. Comments On Mar 02, 2016:I use this wax for all kinds of applications. It is a very good wax. I especially like it when sanding lidded boxes made with exotic woods as it keeps the heat down and produces a superb finish. Comments On Nov 26, 2013:This wax can be used several different ways. It can leave a matte finish or semigloss if a sealer is used underneath it. It is NOT food safe so please beware if your project is to be used for holding or serving food. Some of my customers and friends don't want a glossy fake looking finish and they seem to like the one that Crystal Clear provides. VERY easy to apply and reapply on a lathe or by hand.